find it, or in some cases it may find you! County Emergency Services says it took several hours to clear the animal from the house. laced with hallucinogenic mushrooms and marijuana, Reuters reported. lollipops," police officers told Reuters. drug-laced honey in the shop, which is located in a trendy east Berlin neighborhood. a police officer, Reuters reported. Attention bald men: New Zealand's national airline needs you! The airline would pay $660 for each walking billboard, a company official said. 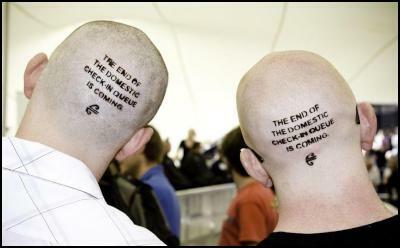 The tattoos will promote a new system that is meant to reduce check-in waiting times. Air New Zealand marketing manager Steve Bayliss described the campaign as "a bit of fun." Dog appears as witness in murder trial. to a suspect. It is said to have "barked furiously". judge is yet to reach a decision. Scooby to the rescue again. A skunk! Shades of Peppy LePew cartoon stories. Guess the woman found the white stripe on the cat endearing? more than once of drunken driving has been charged with driving under the influence himself. with his SUV idling at a 7-Eleven on New Hampshire Avenue in Silver Spring on May 1. Anticipated the need in advance--that is thinking ahead. Can he do the same for his life and re-think some actions? PORTLAND, Ore. - A patient treated for agonizing abdominal pain received some surprising news in paperwork issued by an Oregon hospital. It read: "Based on your visit today, we know you are pregnant." Surprising indeed for 71-year-old John Grady Pippen. mountain lion weighing 80 to 90 pounds. the lion hissed at her, but she wasn't scared. The abandoned home on 1606 Perkins received eight bids on eBay.com and sold for $1.75 Wednesday evening. any plans of moving from (Chicago)." owners will tell you nothing. he should pay his TV and radio licence fee. primary school bearing his name. The author of Ode to Joy had been registered with GEZ as a householder. The eBay home sale has that "fix-it-upper" appeal. Unless the buyer can get the Extreme Makeover crew interested in a wooden home...notice the tall grass? As for the dead poet, someone must have faked their identity to get some services. Think that service crews and billing departments need to have a meeting to verify the addresses in their system.